When Elizabeth Luxford found out her husband James already had a wife, she went to the Court of Assistants in Massachusetts Bay Colony. She then got the first-ever Puritan divorce in December 1639. Only the very privileged could obtain a divorce back in England because the Anglican church viewed marriage as indissoluble. Henry VIII was the rare person who could get four marriages dissolved. In England, the only way out of a troubled marriage was a 'bed-and-board' separation. Not the Puritans. They rejected the Anglican and Catholic view of marriage as a sacrament, thinking it a 'popish invention, with no basis in the Gospels.' They redefined marriage as a civil matter only. If a marriage partner violated the marriage agreement, the injured party could escape the chains of matrimony with a Puritan divorce. 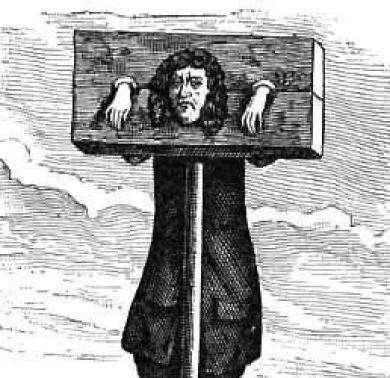 Magistrates often ordered harsh punishments for the guilty party in a divorce, including fines, whipping or time in the stocks. The guilty party could not marry again, though the injured party could allowed to get married again. The Massachusetts Bay Puritans gave the governor's council, known as the Court of Assistants, the power to decide divorce cases. That’s where Elizabeth Luxford went to ask for the first divorce, not just in Massachusetts Bay but in colonial America. She already had a daughter with James Luxford, and she was pregnant with their second child. A magistrate not only granted the divorce, but seized James Luxford's property and gave it to Elizabeth. Luxford probably left his first wife in England, which wasn’t all that unusual. 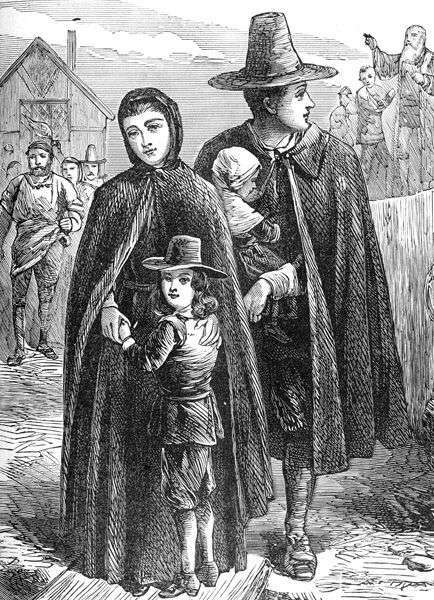 The court would not have given his property to Elizabeth if his first wife lived in Massachusetts, because that would reduce the first wife into poverty. The magistrate gave a harsh sentence to James Luxford for his Puritan divorce. He could not come within sight of Elizabeth, and he had to give her all his property. He had to sit in the stock for an hour and to pay court fines of 100 pounds. Finally, the court banished him from Massachusetts. Elizabeth Luxford, who changed her name back to Albone, was well rid of him. He later was later found guilty of 'forgery, lying, and other foul offences' and sentenced to a whipping, to have his ears cut off and to be --again -- banished. He fled to Plimoth Plantation, where he lived in extreme poverty and distress. She remarried and enjoyed the beneficence of the church in Cambridge. The guilty party in a Puritan divorce. The next Puritan divorce didn't happen for another five years, when Anne Clarke’s husband deserted her to live with another woman. Massachusetts granted 31 of the 40 petitions for divorce or annulment in the 53 years between 1639 and 1692. Most divorces resulted from desertion or infidelity. One of the 31 divorces was granted to the great Puritan theologian Jonathan Edwards’ grandfather. Lovelessness could not be grounds for divorce. If husband and wife didn’t love each other, Puritans expected them to stick together as an economic unit. A woman had a harder time than a man to get a Puritan divorce for adultery. In 1655, Joan Halsall got a divorce after she charged her husband George with 'abusing himself with Hester Lug' and being 'an uncleane yoake-fellow.' Four years later, George Halsell appealed the divorce to the General Court. The General Court sided with George, voiding the divorce and declaring he could 'have and enjoy' Joan Halsall again. Rhode Island in 1650 passed a law allowing divorces on the grounds of adultery, and later on the grounds of desertion and impotence. Rhode Island would later emerge as the divorce capital of New England. In New Haven, the law granted divorce for adultery, desertion or a husband's failure to perform his 'conjugall duty' to his wife. John Vffoote's wife Hannah Beard divorced him for 'insufficiency' (impotence) in 1657. Later he went to court on charges he fornicated with his father's servant, Martha Netleton. Vffoote defended himself by saying Hannah didn't act 'toward him as she ought.' Martha, on the other hand, restored his faith in himself. Testimony revealed Hannah thought John a 'foole' and felt no 'wife-like affection for him.' John and Martha had to pay a fine for fornicating, but they could marry (and then fornicate). An African-American in Massachusetts could get a Puritan divorce. In 1768, a free African-American woman named Lucy Purnan asked for a divorce on the grounds of extreme cruelty. Her husband had kidnapped her by force and sold her as a slave. She got the divorce. With thanks to Divorce: An American Tradition By Glenda Riley. This story about the Puritan divorce was updated in 2018. Where were the images in this article sourced from? They are in the public domain.